“A hand-crafted masterpiece.” “Superlative in every single respect.” “A pinnacle of design unlikely to ever be equaled again.” These are just some of the amazing things that have been said about my sweet Photoshop skills. 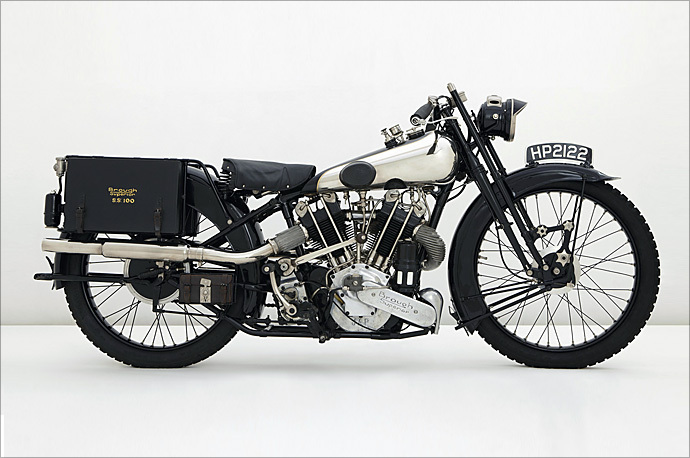 But coincidently, they have also been used to described the world’s ultimate collectable motorbike, the Brough Superior SS-100. Pronounced “bruff” for the uninitiated, they wore that final part of their moniker because every single example was tested by factory riders to 100 mph before it left the Nottingham factory. And if that doesn’t impress you, how about the fact that each bike was not only a bespoke build, but they were all assembled twice – the first to check fit and tolerances, and the second after all the components had be plated, painted, or otherwise finished. It’s also known as the first custom motorcycle, as all the components were sourced from separate suppliers that were chosen for their individual expertise in their respective fields. “How much?” I hear you ask. Barely more than 5 months ago a pristine example of a 1929 SS-100 was sold at the Haynes International Motor Museum Auction in the UK for £286,000/US$463,000. Gag. So let’s cut one up, shall we? So how’s this work? You enter your ideas on how we should customise the Brough via the comments section below. We then choose the winner, work with them to make the mods in Photoshop, and post the results. The winner gets a brand new pair of Icon gloves of your choosing worth up to $145 North American clams. Booya! The winning idea has to be a corker. It should not only look good, it has to be a great idea. We want people to see the finished product and say “wow”. If your idea doesn’t pass this test, keep on thinking. We want George Brough to be spinning in his grave and Paul D’Argent to openly weep when he sees what we have done. Bring it. DO NOT post links to your own mock-ups. No matter how cool the idea, this will instantly rule you out of the comp. Why would we choose an idea that everybody has already seen? Let’s blow out the candles before we eat the cake, yes? An entry along the lines of “CAFE RACER!” has about as much chance of winning as my Nanna; and she died two years ago. Aim for around 100 words. If you still insist on doing this we’ll simply let other people use your idea for their own if they like it. Hello “Stephen F” if you’re listening. Multiple comments are fine if you think you’d like to add to your original ideas. We reserve the right to openly mock, laugh at, or otherwise make fun of your ideas. Especially the ones that involve trikes. If you aren’t sure exactly what to write, just pop back to a previous competition and take a peek. Study the winning entry closely; it’s the very first one in the comments section. We’re looking for creative, original, clear ideas. The more interesting the ideas, the more likely they are to win; if we can make a Triumph hill climber look that good, then the sky’s the limit. You have 72 hours to get your ideas posted before we close submissions, so get them in ASAP. Please leave a valid email address so we can contact the winner. Ladies and gentlemen, light your blowtorches!